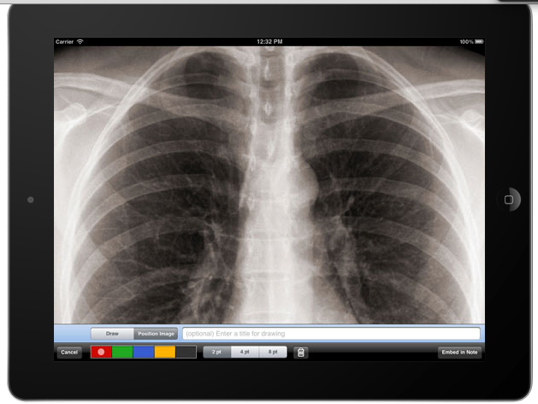 Drchrono, a startup that simplifies the professional lives of doctors by bringing electronic health records and much more to the iPad, has raised $2.8 million in funding led by Yuri Milner, with Google’s Matt Cutts and other investors participating. The startup had previously raised $1.3 million in seed funding from Milner, General Catalyst, Charles River Ventures, 500 Startups, Gmail creator and FriendFeed cofounder Paul Buchheit, Cutts, and the Start Fund. Y Combinator-backed drchrono streamlines the professional lives of doctors and medical professionals by bringing electronic health records and much more to the iPad. The free iPad app allows doctors to schedule patient appointments, dictate notes via audio, take pictures, write prescriptions and send them to pharmacies, enable reminders, take clinical notes, access lab results, and input electronic health records. The electronic medical records element is key because the Obama administration is currently offering strong incentives for doctors to start moving their health records online. Drchrono will help doctors start, finish and manage this process. Last year, the startup received official government certification, allowing participating doctors to receive $44,000 in incentives when they use drchrono as an electronic medical records platform. Doctors can upgrade to more storage for records, and complete medical billing. The billing component is another win for doctors, who spend hundreds of dollars each month for medical billing processing. Drchrono’s system integrates with all U.S. insurance companies, even the insurance agents that only use paper billing. With Billing Center, physicians can sign up to do medical billing and start getting payments within days directly from their iPads. The platform is already compliant with the government’s new payment standards, 5010, which supports ICD-10 and ICD-9 medical codes. 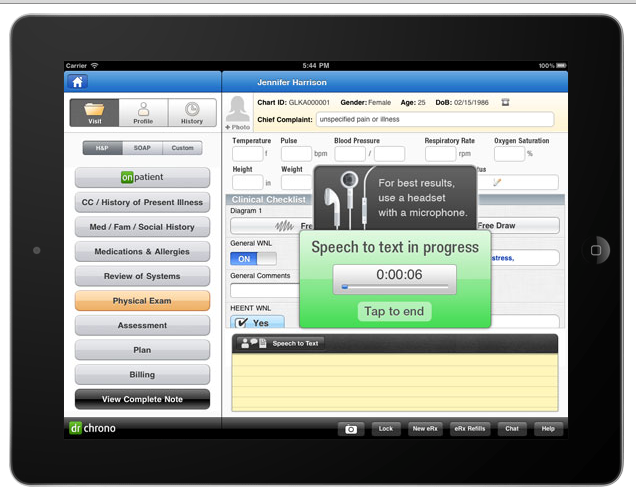 In August, Drchrono released another iPad app, called OnPatient, which replaces the patient check-in process. So, as soon as you enter a medical office, you are generally given a clipboard with a number of forms to fill out in the waiting room, including general information, medical history, confidentiality agreements and more. Offices can give users Drchrono’s free iPad app instead of a clipboard, which allows patients to complete family medical history, demographic information, and insurance information; take a profile photo and sign the HIPAA consent form with a digital signature. With the app, you can only fill out your form and are locked into this interface so patients won’t be able to switch to other apps or access other patients’ information. And to make doctors’ lives easier, the app integrates with drchrono’s medical records interface, so medical personnel don’t have to type in all the patient information. On subsequent visits, patients do not have to complete duplicate forms—they need only review their information and make any necessary changes on the iPad. The company also announced it now has more than 15,000 registered providers, and more than 400,000 patients using the drchrono platform. Drchrono playing the online medical space in an interesting time, as medical records move online, and mobile technologies are making their way into both the operating and exam room. Doctors are increasingly bringing laptops into the exam room to take notes, write prescriptions and more. But laptops can be cumbersome, and the iPad has emerged as a popular device for medical professionals. But the electronic medical records space is still evolving. For example, Google recently shuttered its online health platform Google Health. However, others in the space are growing. Practice Fusion has become one of the biggest providers of EMRs in the country, with 25 million digitized to date. Kaiser Permanente just released an Android app to help take patient electronic medical records mobile. Clearly, investors are betting on drchrono as a viable option for doctors to manage electronic health records and medical data on mobile and web platforms. Stay tuned.